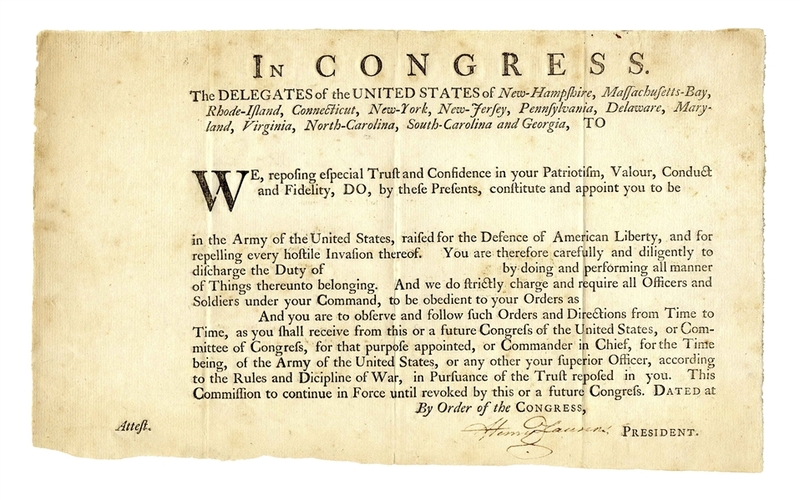 Henry Laurens document signed as President of the Continental Congress, signed in either 1777 or 1778. Here, Laurens signs his name to a blank military document in anticipation of a military appointment for the Revolutionary War. Document reads in part, ''In CONGRESS...in the Army of the United States, raised for the Defence of American Liberty, and for repelling every hostile Invasion thereof. You are therefore carefully and diligently to discharge the Duty...'' Measures 13.25'' x 8''. Irregularly trimmed lower edge and folds, otherwise near fine, with very little toning given age.